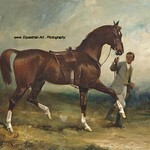 Equestrian Fine Art photos printed on top quality canvas and framed in a premium Optics frame. Price : 375 euros including shipping. Delivery in less than 5 days. Payment via PayPal. The author died over 100 years ago, so this work is in the public domain in its country of origin and other countries and areas where the copyright term is the author's life plus 100 years or less.